In fact, global interest rates have been declining for at least six centuries, in a 'supra secular trend' that has seen real rates fall from over 9% in the 15th century to just 0.5% today (chart below). Multiple theories have been proposed to explain this trend (demographics, debt, slowing growth) — but whatever the cause, it's a long-term trend that can help current investors frame their expectations about possible real interest rate levels in the decades ahead. 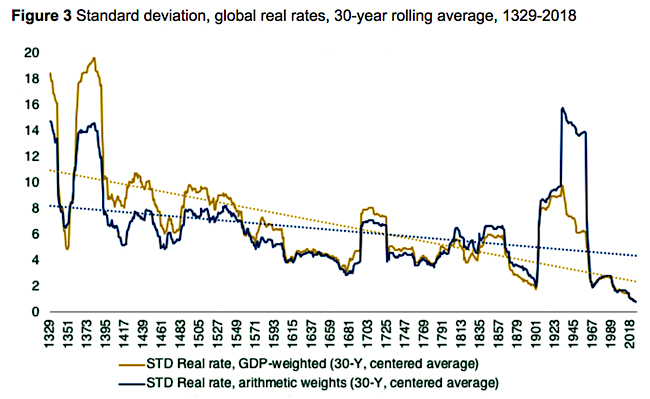 Interestingly, the authors also calculated the standard deviation history of global real interest rates (chart below), indicating that the 20th century had well above-trend volatility — primarily due to a depression, two world wars, and global oil shocks. DISCUSSION: Based on this centuries-long trend of falling rates, it appears it was the high real rates of the early 1980s that were anomalous, NOT the low real rates of today. Even if future real rates spike upwards — due to geopolitical or natural disaster shocks — it seems unlikely to change the long-term trend toward low or even negative real rates in the decades to come. Last edited by SimpleGift on Sat Apr 13, 2019 12:57 pm, edited 1 time in total. 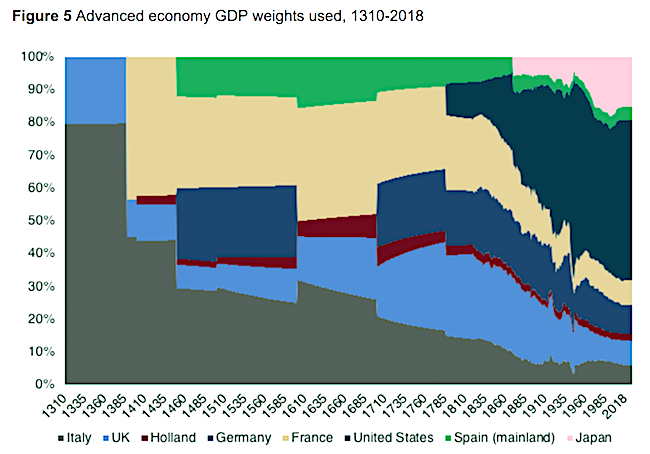 Just to add: These are the historical GDP weightings used by the Bank of England to derive their real interest rate series over the seven centuries. Make sense, it was when the Vatican’s power was at its height. Age of the Medicis, Machiavelli, etc. Overall, this trend is why in 10-20 years the bond recommendation for the three fund portfolio will become long term Treasuries instead of total bond market. You heard it here first. This is great. What has happened over time is the destroyers of wealth/capital (war, famine & epidemic) have declined over time & allowed compound interest to do its work to create alot of capital & a corresponding decline in the cost of that capital. The yield curve inverted sometime around 1693. If Vanguard Total World existed in the 1300’s you would only own 2 countries worth of stocks? Lol. Echoing Dr. Bernstein, my sense is that low real interest rates — and high asset values across the board today — are just the price we pay for living in such a relatively stable, prosperous and interconnected world at present. Not sure I'd want to go back to the financial insecurities, famines and turmoils of previous centuries, just to have lower asset values and higher expected returns! If the current environment of lower real rates and higher asset values is our new normal, though, one aspect that does concern me is the potential for deeper and more serious financial shocks when they do happen to occur (ala 2008). In other words, though everyday societal risk may have declined over the centuries, it's possible that the left tail or black swan risk to portfolios may actually have increased, as a result of the persistently higher asset values in many categories today. In response, I've slowly been increasing the credit quality of my "safe assets," i.e., transitioning from munis and corporates to mostly Treasuries now — though maybe I'm just getting older and more conservative. Italy, after all, is where the renaissance started. Bermuda and Cayman have lots of banks, but their GDP is another thing entirely. In other words, even though China and India had substantial GDPs in the 14th through 18th centuries (together at 50% of the global total), there are not long-term interest rate histories available for these economies — as best I know. Great post as usual, SimpleGift. Only one thing to add that might upset the multi-century low interest rate/high valuation trend. The graphs go back to the dawn of the Renaissance and the trend has been steady since in Europe. If instead, we started at the fall of the Roman Empire and ended in the Dark Ages or Middle Ages, the trend would be quite different. The GDP of Europe and the Mediterranean basin reached unprecedented heights in the Roman Empire which had brisk trade without tariffs throughout the Empire, prolonged political stability, ever advancing technology, a single currency, single language, and single legal system everywhere from Saudi Arabia to Scotland as well as all of North Africa, something that has not been achieved since. After the Empire collapsed, there followed a thousand years of chaos, constant and endless war and destruction, and no rule of law other than whoever happened to wield the biggest sword. GDP in this huge area did not eclipse the highs it reached under the Roman Empire for 10 centuries. A higher percentage of homes in England had central heating during the Roman Empire than in 1850 for example. Rome did not run a just and egalitarian state--there were victims on top of which this wealth was created--but it did create productive economics for centuries. The entire direction of civilization, the rule of law, property rights, stability, and economic progress reversed for centuries after Rome fell during which no one felt secure enough to lend money at any interest rate, nor to take risk buying a business. The odds that such a scenario will be repeated again are remote but it's important to remember that the road of human/economic progress is not always a steady smooth path with higher equity valuations and lower interest rates. 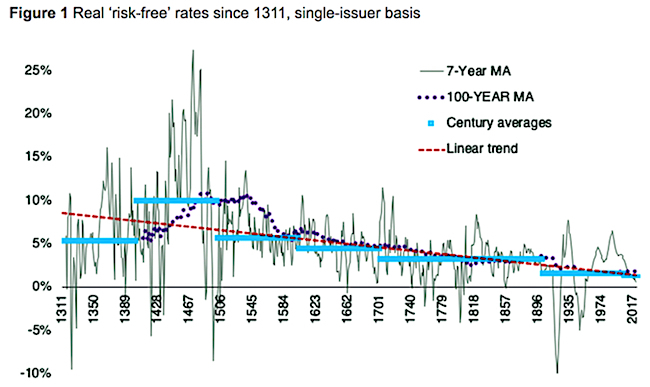 Not sure that there was meaningfully such a thing as a "risk-free" rate until the 20th century. Prior to the 20th century, and certainly back in the 1300s, money was physical currency and sometimes physical paper records. These could easily be lost, destroyed, or stolen, and in fact were lost, destroyed, or stolen at fairly high rates. Additionally, even the strongest "government guarantees" of that period were periodically reneged on by monarchs (who would often take the extra step of killing, imprisoning, or exiling the money lenders). Therefore I would suggest that the long term fall in rates is probably better explained as a long term decline in the *risk* (both monetary and physical) of the least risky debt, thereby bringing it closer to "risk free", rather than a long term decline in the risk free rate. Perhaps this also has to do with democratization of capital, in which more and more entities have become capital providers over time, therefore increasing supply of borrowed funds. In the 1600s, I don't know how easy it would have been to walk into a branch and get a business loan. You'd probably have to walk for 4 days to reach the estate of your local vassal, who will demand 30% of your harvest while making eyes at your 5th daughter. Interesting the degree to which inflation contributed to the historical interest rates series (nominal) that we are accustomed to looking at for the 20th and 21st centuries. You also have to remember that before the industrial revolution most folks were subsistence farmers and the real growth of GDP from the fall of Rome to 1500 was 0% per year. During this period, you gained wealth by conquering your neighbor or some foreign nation there was no accumulation of wealth by investment. The Dutch were first to grow at the high rate of 0.5% per year for 200 years (1500 to 1700), which made them rich. This growth was caused by at first the reclamation of fertile land by capital intensive windmill & dyke building then by overseas trading. They were also able to borrow at 4 to 5% because they actually repaid their debt. After the industrial revolution, growth rates increased closer to the current rates of 2 to 3% real GDP per capita growth. The US has grown by about 2% real GDP per capital growth rates since our founding. This rate leads in doubling of the standard of living per person every 35 years. This should not be surprising as more countries switched to currencies not backed by hard assets. The benefits of this might very well dominate the deteriments of inflation, though we cannot debate that here. The real (no pun intended) takeaway is the reinforcement of declining real rates. The real (no pun intended) takeaway is the reinforcement of declining real rates. Is the risk-free rate actually defined in real terms, ex-ante? This makes sense, as the study authors religiously uses quote marks around each reference to the "risk-free" real rate in their paper — without ever actually defining what it is, as best I can determine. But the main thrust of their study still stands, I believe: a plot of real interest rates over time can be a kind of "fever chart," indicating the stability and prosperity of the times, with lower rates when times are relatively stable, and higher rates when unstable. From this perspective, one can argue that the most significant global ailments of history (famine, war and epidemic) have largely subsided, leading to today's persistently low real rates — though I can't believe the world is entirely free of systemic ailments! Very simple, wealth increases, becomes less scarce and the cost to borrow it falls. Nothing more going on. If 1500 AD every turns up again, my long term treasuries are toast. Thanks, Simplegift. Another intriguing topic from you. It would appear that humans have learned how to price risk fairly appropriately over the centuries. I remember reading that the Medicis's charged interest rates of 13% because the Italian city states were risky credits before the consolidation of the nation. Lloyd's priced insurance rates based on the hazards of shipping. Of course, there are innumerable examples of outfits that guessed wrong, like Equitable Insurance, that wrote under-priced annuities in the eighties. I would have to concur with your logic that if interest rates are low because an interconnected world can better understand risk, then we may be in for one of those inflection points where our understanding of security valuation has to change. (Shudder) but maybe that explains how suddenly Greek bonds now yield less than US treasuries only a decade after the debacle. We'll see someday if all this was just a credit bubble and a central bank induced asset bubble. If it's a new phenomenon of permanently lower real rates, then stocks may be the best bets around. What we don't know is how often we get turns in the business cycle and how long the recoveries take. It appears the cycles are longer and so are the recoveries. The uncertainties may now be greater than previous even though the risks are better understood. I don’t think it’s fair to say they had the only banks, but Italy was at the forefront of a new renaissance in banking. And that’s down all the way to 80% from 95% during the reign of the Roman Empire? If 1500 AD ever turns up again, my long term treasuries are toast. 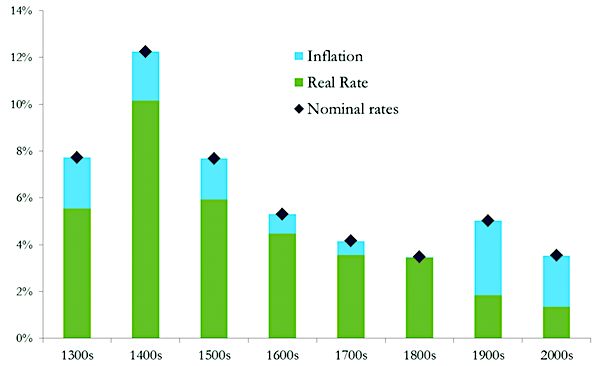 Bank of England wrote: The all-time peaks in real yields in the mid-1400s coincide with the geopolitical escalations amid the fall of Constantinople, the seizure of silver mines by the Ottomans in the Balkans, and evidence of increasing European balance-of-payments deficits to the Levant — factors consistent with the narrative of a Great Bullion Famine. The “real rate turning point” thus somewhat precedes the classical dating of the financial revolution and the sharp inflows of New World treasure. The breadth of subjects one can learn about from even a casual reading of financial history continues to impress. Interestingly, the high inflation rates in the middle ages occurred during arguably hard asset regimes, where silver coins were the main medium of exchange. The extreme decline in the population because of the Black Death reduced the labor pool, and the survivors were able to demand much higher wages. The US has grown by about 2% real GDP per capital growth rates since our founding. This rate leads in doubling of the standard of living per person every 35 years. That certainly helps to frame the concerns of any given time re:future growth. Take this with extreme caution. Maddison is the best out there, AFAIK, but that does not mean it is anywhere accurate. GDP is a concept that arose in the 20th century economy. Backcasting it involves making huge assumptions. Except the recent growth is more like 1% per capita? Say since the late 1970s? Certainly since 2000? 2% is anything but a "law" of economics. From memory the Black Death caused a *fall* in prices? Production dropped, but demand even faster? Real wages rose because of a shortage of labour. Hence the Peasant's Revolt (1381) as landlords in England made legal moves to try to tie the workers more tightly to the land - to stop them leaving for higher wages. It's also how the Plantagenet Kings lost France (England won all the main battles -- Crecy Poitiers Agincourt, but lost the war). 30-50% of the population of Europe died in each visitation, starting with the first in 1346. There was a US scandal called Equitable Insurance, I believe (I think it was a computer based fraud; overstating numbers of policy holders). The UK one was the Equitable Life Insurance debacle - it's always said "Equitable Life". I would have to concur with your logic that if interest rates are low because an interconnected world can better understand risk, then we may be in for one of those inflection points where our understanding of security valuation has to change. (Shudder) but maybe that explains how suddenly Greek bonds now yield less than US treasuries only a decade after the debacle. Partly it's the ECB and their programme of Quantitative Easing. But also partly it's the German government bond yield - which is negative. It's the risk spread of Greek bonds over German that counts, rather than the absolute interest rate. The analogous phenomenon in the US Dollar bloc is the low rates some Emerging Markets are able to borrow at, despite a history of crises and defaults (Mexico as an example, or Indonesia). What the Greek government bond yield is telling us is that the market thinks the Eurozone is going to be depressed for a long time to come, and so it is not pricing in any kind of Eurozone interest rate rise. Whereas with the USA the market is pricing in some sort of interest rate rise - the US economy is pretty near full employment, as conventionally defined. You see it in the unemployment rate (albeit the 25-64 year old employment rate is still below 2000 highs), in the reported shortages of labour (construction, truck driving, airline pilots etc), in rising wages, in greater union militancy (they feel they can afford to take a risk - their services are potentially in short supply). Falling immigration no doubt helps by reducing that supply of labour as well. We'll see someday if all this was just a credit bubble and a central bank induced asset bubble. If it's a new phenomenon of permanently lower real rates, then stocks may be the best bets around. What we don't know is how often we get turns in the business cycle and how long the recoveries take. It appears the cycles are longer and so are the recoveries. The uncertainties may now be greater than previous even though the risks are better understood. Central Banks have control over nominal interest rates. It's doubtful whether they have as much (or any?) control over real rates? Because the real rate is set by the fundamental demand and supply for loanable funds -- capital, in effect. What's actually going on in the economy. I am not a Rational Expectations Hypothesis purist, that monetary measures have *no* effect on the real economy, but I think we can overestimate the amount of control Central Banks do have over the financial markets and the economy. They can move nominal quantities around but find it much harder to move real quantities. Exception - in a liquidity crisis like 2008-09 or 1929-1931, the actions of the Central Banks really are critical. It's possible to turn a bad situation, worse, very easily. Last edited by Valuethinker on Sun Apr 14, 2019 7:44 am, edited 1 time in total. You also have to remember that before the industrial revolution most folks were subsistence farmers and the real growth of GDP from the fall of Rome to 1500 was 0% per year. During this period, you gained wealth by conquering your neighbor or some foreign nation there was no accumulation of wealth by investment. The Dutch were first to grow at the high rate of 0.5% per year for 200 years (1500 to 1700), which made them rich. This growth was caused by at first the reclamation of fertile land by capital intensive windmill & dyke building then by overseas trading. They were also able to borrow at 4 to 5% because they actually repaid their debt. After the industrial revolution, growth rates increased closer to the current rates of 2 to 3% real GDP per capita growth. I think the conclusion is that in the first 100 years of the industrial revolution, say up to 1850, Britain grew by about 1.0% p.a. For the average person the improvement in standard of living was quite small - albeit as always we undermeasure the impact of technological change. Yes although real GDP per capita cycled in the period before 1500. What happened was that better weather, more food production tended to increase wealth per capita and standards of living. The standard of living in 1250, say, was a lot higher than it was in 1050 for most people in Europe - you can see it by the size of Cathedrals they built -- late Gothic architecture. Late medieval civilization had significantly greater materiel wealth than early medieval. In some ways they had surpassed the Romans (although generally the Roman Empire around 200 AD say had the highest standard of living ever achieved). There are similar patterns in Chinese and Indian history (but I am not very familiar with those). Then the old friends of rising population, bad weather, war & pestilence came to visit and drove it back down again. The interesting one is that you can find techniques of advanced field cultivation such as crop rotation and marling in late medieval Norfolk (early 1300s) - a sign of high food prices making it sensible to invest in the land (still the most productive arable land in England). Those then disappear, but reappear after 1650 as the next cycle of population growth (and export markets) had kicked off. Even before the Black Death hit in 1346, there was a marked decline in trade and other signs of economic activity in the early 1300s as well as major wars (the kick-off of the 100 Years War between the English kings and the French ones, for example). Economic historians have noted the decline of the great trade fairs in Brabant (Flanders) as an example of the decline of trade. There's also the "European marriage pattern" debate. Later marriage means fewer children - that's still true if you consider the birth rate in Utah, say, with other states. What emerged in late Medieval Europe, it appears, was a much greater percentage of women marrying late, or entering lives of complete celibacy with the Church. Thus the population did not rise as fast as the food supply did - there actually was an increase in per capita standards of living. Local lord or seigneur I think you mean? You were a vassal (tied subject) to them. There were local moneylenders - I think there's evidence of same. As Jews were prohibited from many trades and professions, they often fell into those roles. I think this is key. Greater stability begats greater risk taking. It used to be merchant banks could only lend their capital, and since it was their partners' livelihood, every loan was scrutinized very carefully. There is a play in London now "The Lehman Trilogy". It's not about the 2008 events which are just an afterthought. It's about when the Lehman family, a family of orthodox Jews, moved to Alabama in the 1830s and became merchants supplying the farmers, then cotton merchants then bankers. Just before the Civil War they opened a branch in New York, and post that that became the HQ. But there's lots of clues to how a family of orthodox Jews from Bavaria would run a bank. Reminded me of the great days of British merchant banking- Rothschild, Warburg, Morgan Grenfell etc. Really this is Hyman Minsky's point. That the stability creates the groundwork for the subsequent greater crashes. The individual level of risk is lower, but the risk level of the whole system is rising all the time as individuals are incentivized to take more risk. That's pretty clearly what happened in the lead-up to 2008-09. I have the same feelings about international stability. We have had 7 decades of unusual international stability & no world wars. Whereas previous centuries saw the 7 Years War, the Napoleonic Wars -- the first truly global wars*. Then came the long peace from 1815-1914 (it didn't feel like that if you were a colony of the Europeans, being subjugated; China had a civil war, the Taiping Rebellion, which killed perhaps 40 million people). Then we had the 2 phase war which we now call World War One and World War Two, but it's quite likely that future historians will see it as 2 phases of the "the Anglo-French-Russian v. German European global war". We've had another long peace. The next time we have a great power war, it could finish us all. * the Anglo-Dutch-Spanish wars encompassed by The Great Revolt (of the Netherlands against Spain) and the Elizabethan wars against Spain had a global dimension. Although I think there could be some instability, the stability has provided a large capital cushion. One way to look at capitalism is that it creates great wealth better than the previous systems. This accumulated wealth either grows in peace or is destroyed in war, famine or epidemic. What is interesting is the expected return of equities has not declined to the same extent as interest rates have over the past 200 or so years in the US. If you look at both Siegel's and Damodaran's data sets you can see this. Siegel has estimated a real return of 6 to 7 percent over 200 years (Siegel's constant) while Damodaran has an ERP that has ranged from 2 to 6 percent. Since 2000, interest rates have declined from 5% to 2.5% but expected returns from stocks have stayed pretty consistent at 7 to 8% according to Damodaran. Damodaran's current ERP is about 5%. This implies that over the periods observed that stocks (the beneficiaries of innovation) have been rewarded for continued innovation while bonds have not. When innovation does not live up to promise, equities are hurt (during the tech boom/bust) but over long periods of time, the upside of innovation reveals itself in higher stock returns. IMO this may be why the prognosticators of low stock expected returns on average are proved wrong. You do need to be cautious with money you need to live on as the return for this innovation is a long-term upside not a short-term one. What is interesting is the expected return of equities has not declined to the same extent as interest rates have over the past 200 or so years in the US. It's at best a forecast that lower interest rates won't lead to lower equity returns in the future. Since 2000 they have? I don't think the evidence says innovation is good for corporate profits? For listed companies at least these are by and large the incumbents. And technology tends to kill incumbents. Think what Google and FB have done to conventional advertising media. Amazon to retailers and publishers etc. Private companies exceed the profits growth of public companies in the USA I believe. And EPS growth runs behind GDP growth. Evidence I think that founders and venture capitalists optimally time their IPOs past the point of maximum value growth. It's actually very mature industries like tobacco that pay the big share holder returns. Mounds and mounds of cash thrown off. Except there too there is now innovation (vaping) which hits incumbent profits. Consider another highly innovative industry. Fracking. From what I have seen it appears the crackers don't fully cover their cost of capital. Huge value is being created for the world oil consumer and for workers in that industry but not for investors into it it seems. And the business models of the oil super majors are at least somewhat threatened. Technological change is great for societies. None of us would want to have leukaemia in 1970 compared to now. Nor the safety features of a 1968 car v a 2019 car. New solar technologies offer the possibility of virtually infinite free electricity. However it's not clear to me this makes things more profitable for incumbent players. My own sense is what has happened is the balance has swung from labour to capital in the last 50 years. And that we are pushing the limits of that. The political ructions of the last 10 years are just the beginning of a snap back somewhat reminiscent of the 1930s. Given the demographics it's going to be quite hard for companies to hold the line on this. Also the pace of technological change seems to be picking up. The new AI technologies will destroy a lot of incumbents. So its likely that we are at the end of one of those long cycles that first became really detectable when M Thatcher was elected in 1979. And we are headed for unknown territory. Just as we were in 1913 or 1938. 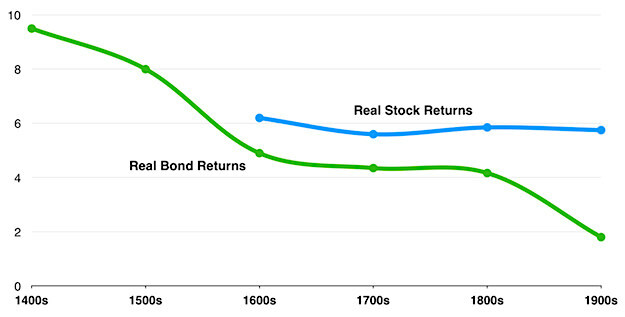 Low bond returns in other words presage lower stock returns. Oh, man! I almost bought consols in 1347, but the black death intimidated me. I am basing my view on the historical data as provided by SimpleGift, Damodaran & Siegel. There are others who think there will be lower returns but IMO to date they have been proven wrong. I also become more skeptical of the lower return hypothesis as the market IMO is becoming more efficient over time & the longer the returns stay high, the more wrong the lower return hypothesis is proven. One item the lower return hypothesis folks do not account for is the value of the unforecasted advances in technology that create large amounts of wealth. Although this effect is not consistent over time it does occur but is lumpy. The benefit of these advances accrue to equity holders. I agree incumbents will be hurt by innovation, but suppliers also benefit. One way to see the aggregate benefit is to look at the market cap of entire stock market. This clearly has increased over time despite the losses by the incumbents. I wonder what EM corporate bonds were paying when Genghis Khan was roaming the steppes of Central Asia? That’s an extremely interesting figuring, thanks! It makes sense China was such a significant part of the world economy (Silk Road, etc.) since it was such an advanced civilization until the Renaissance. Treat Maddisons numbers with extreme caution. They are really only indicative. China was as technologically advanced or more so than Europe until the 1600s. Around 1700 the ?Qing Dynasty begins to break up and China becomes subject to foreign barbarians. In the Opium Wars of the ?1830s? Britain enforces its control over Chinese customs (opium became an addiction for I think an estimated 1/4 (IIRC) Chinese men - all smuggled from British India). Culminating in the Taiping Rebellion of the mid 19th century, when something like 40 million people are estimated to have died in a bitter internal civil war. Beginning in 1912 it starts to expel them again and eventually a new Dynasty rises to power. What we call the Chinese Communist Party. From 1949. (The Boxer Rebellion 1899-1900 was very much in keeping with this. A mass uprising to throw out foreigners, which was brutally put down by a coalition of allies. However the forces of Chinese nationalism that had been unleashed would not be suppressed forever). This is all of a cycle with Chinese history back into the BC years. The rise of a strong dynasty and China comes to dominate its neighbours politically, militarily and culturally. Then the dynasty weakens for whatever reason and foreign barbarians flood in, may actually become the rulers. The foreign rulers are then either assimilated into Chinese culture or eventually expelled. The end of the British rule over Hong Kong (1997) was the culmination of this. A new, strong dynasty rises and the Han people once again come to dominate East Asia (and into Central Asia) and to be the single largest economy and country in the world. We are in such a cycle now. Modern technology and economics extends their potential reach and power, and possibly durability. I saw this chart a couple of years ago. It made me think there might be a "short term" high of around 7-8%. Get long bonds when that happens! High bond YTM is created by cheap bonds. Which means the assets are not viewed as desirable by many investors, or maybe they just don't have the money to buy. Buying cheap assets can be hard for many people to do in practice. As bad as inflation got, it could have gotten much worse, and has in many countries.